Canvas is the new Learning Management System being adopted by Oklahoma State University in Fall 2019. It is a flexible, easy-to-use platform with a clean interface, rich multimedia capabilities, and dedicated mobile apps for both students and instructors. ITLE fully supports instructors and TAs interested in learning more about Canvas usage and best practices through a combinations of trainings, instructional videos, and one-on-one consultations. Use the menus to register for a face-to-face or virtual training session. Use this form to participate in ITLE's Canvas Pilot Program beginning Spring 2019. Contact ITLE with questions and we will be glad to help you: canvas@okstate.edu or (405) 744-1000. Brightspace can export course content in the form of a ZIP file that can be imported into Canvas. Canvas can import ZIP file exports from Brightspace as a way of transferring content from one class to another. Content can be imported into a Canvas directly from other Canvas courses, which is very useful when re-using content from one semester to another. The same process can be used when copying content from a Sandbox or Test environment into an actual course. Canvas lets instructors customize the dashboard images of courses by using header images. These can be a useful way of distinguishing courses from each other and providing visual cues as to the type of content contained within a course. Instructors can customize the Canvas dashboard to suit their individual needs and preferences. Customization options include expanding and collapsing the sidebar, assigning course nicknames, changing course header color, and showing/hiding the color overlay on top of course header images. The Calendar tool in Canvas can be used to display relevant dates from all courses, and individual course calendars can be enabled and disabled on the fly. Adjusting due dates by drag-and-dropping items on the calendar will also change the due dates for the individual items within the course. The Calendar also shows course items based on the course color codes specified in the Dashboard. Instructors can use Announcements to update students with up-to-the-minute information and other relevant news. Announcements can be scheduled in advance, and instructors can allow students to respond to individual announcements similar to discussion board topics. Instructors can force announcements to be shown on the course Home Page as well, to make sure students always see relevant updates when they access a course. Every course in Canvas contains a navigation menu that contains items such as grades, discussions, assignments, etc. This menu can be customized on a per-course basis and instructors can choose to hide specific navigation buttons from students. 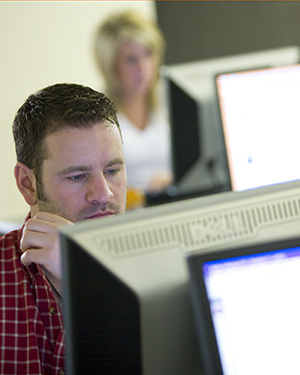 Canvas allows instructors to specify a home page that will be loaded when students access a course. Options for home pages include a custom HTML page, a list of Modules, and a list of assignments, or the syllabus. Most instructors use Modules as the home page for their courses. Regardless of whatever is set for the Home Page, instructors can elect to show recent announcements at the top as well. The Student View option in Canvas allows instructors to see their course from the perspective of a student. This can help ensure that settings such as date and prerequisite restrictions are configured properly. Student view can be used as a way for instructors to peek at their courses through the eyes of a student, which can help pin down problems that students are reporting. This video uses the example of two discussion board threads that are missing for students, with the instructor using student view to get to the bottom of the issue. Canvas allows users to customize their experience by changing their display name, using a nickname, setting time zone, and other options. Instructors can also elect to enable advanced features such as high-contrast UI and enable the use of some tools still in development. Instructors and students can use custom images (i.e. selfies, headshots, etc.) as profile photos. While not necessary for any courses, the use of profile images does help increase engagement by giving students a visual to connect names with faces. Canvas allows instructors and students to get notified when various events happen. (i.e. a change in due date, grades posted, discussion board replies, etc.) Users can be notified in several ways and can add additional methods such as SMS text. Emoji can be inserted into the titles of modules and other areas in Canvas to add a bit of graphical levity and fun to what otherwise might be a somewhat bland way of presenting information. The Commons is a repository for documents, assignments, quizzes, and other course content that has been shared by other Canvas users. The items contained in the Commons can be searched, viewed, imported into your own Canvas course, and assigned a rating and review. The Commons contains a vast array of course items that can be searched, sorted, and filtered according to various parameters you specify. Importing items from the Commons into your own Canvas course is a simple one-click process. When importing assignments, quizzes, documents, and other items from the Commons it's important to check them and examine them thoroughly before releasing them to your students. Most items can be customized (point values, quiz questions, etc.) which is recommended to make sure they are suited to your needs. At many points throughout the Canvas interface there are options to share items to the Commons using the "Share to Commons" button. Items that can be shared include assignments, quizzes, modules, discussion boards, and more. When uploading items to the Commons there are several options to configure such as copyright license, title, grade level, and other metadata. Careful use of this information can help make sure your Commons items are properly organized and searchable. Instructors can use both Modules and Pages to present information and course content to students. Understanding the difference between both of these, as well as some of their similarities, can help instructors choose which one to use in their classes. Modules work well for organizing and controlling the release of content (i.e. Requirements and Prerequisites) whereas Pages allow for richer and more detailed methods of presenting material. Pages in Canvas can include various types of content (videos, documents, external links, text with formatting, etc. ) and the tools to create pages are straightforward and easy to use. Embedded content such as YouTube videos includes auto-generated thumbnail previews, and instructors can add explanations and other helpful text. Pages can be inserted into modules as a way of delivering content to students. Canvas allows for the creation of student groups, which is a useful way to help students stay organized and connected through the Canvas system. When instructors create student groups in Canvas there are several advanced options available such as self- or auto-enrollment, number of groups, and group leadership roles. Students can be put in different groups using a drag-and-drop method as well. Each group of students in Canvas has access to a private group Homepage which allows members to post announcements, have discussions, share files, and collaborate on documents. It functions almost like the private group option on many social networks, but it exists within the Canvas system and is thus free of all advertisements and data mining. To more clearly understand how student group homepages function, this video gives a walkthrough of this tool from the perspective of a student. Using the group homepages, students can post discussions, share files, and collaborate on documents privately. The Conferencing tool in Canvas offers many options similar to third-party platforms such as Skype, GoToMeeting, WebEx, etc. Since it exists within Canvas students do not need a separate account or any other custom software. However, the Conferences tool does require Flash which limits its use on tablets and some other mobile devices. The interface of the Conferencing tool in Canvas is similar to other software platforms such as Skype, GoToMeeting, WebEx, etc. There are options for text chatting, webcam sharing, and whiteboard-based collaboration. Participants can also upload PowerPoints and share their screens. Text-based chatting is not as high-tech and multimedia-centric as other communication options such as videoconferencing, but it can be a simple and highly effective method for engaging with students. The Chat feature offers student photos, timestamps, and emoji integration. Much like smartphones and tablets, Canvas allows instructors to install apps to extend the features and functionality of their classes. Apps can be accessed via the Settings menu and enabled as well as disabled as the instructor sees fit. Most apps, once installed, can be inserted into Modules and Assignments via the External Tool feature. This video shows how to do this via an example involving a graphing calculator app. The Inbox feature in Canvas allows instructors to send messages to a student or groups of students, as well as an entire class, without needing to know individual email addresses. The Notifications screen can also be configured to make sure both students and instructors receive alerts about the messages that are being sent and received. All graded work in a course is treated as Assignments. The Assignments tool can be used to create, manage, and organize all Assignments as well as specify the submission type (online Dropbox submission, no submission, etc.). Points and grading options can be specified as well. Understanding how Canvas utilizes Assignment Groups to organize graded coursework. All assignments need to be in a group, even if they are all in the same group. Breaking assignments into sub-groups can help organize a class and allow instructors to manage content easier. When utilizing many versions of a similar assignment (i.e. Week 1 Homework, Week 2 Homework, etc.) instructors can construct a single assignment and use that as the template for additional assignments. An assignment can be duplicated, and its parameters edited, to allow for the easy creation of many similar assignments. Basic assignment details can be specified from the Assignments navigation tab, but more advanced options can be set such as group assignment, peer reviews, moderated grading, assigning specific groups or individuals, and setting time/date restrictions. The rubric tool can be used to create various criteria by which an assignment is evaluated. Points can be assigned to each criterion and additional criteria can be added in order to thoroughly assess student work. The Turnitin software can be used when setting up or modifying an assignment such that student submissions are automatically checked for academic integrity violations. The Turnitin plagiarism checking software has several user-configurable options such as the ability to exclude certain sources, opting to include student submissions in the Turnitin database, and grammar-checking preferences. A close look at the information provided in the Turnitin Originality Report, specifically the Similarity Score and how those results can be filtered and organized so as to help instructors deal with potential academic integrity violations. This example uses a student paper with a Similarity Score of 37% which was due to three different improperly-cited sources being used when writing it. Discussions in Canvas can be used for instructors and students to discuss and collaborate. Discussions can be Pinned as well as Closed for Comments. Individual discussion topics can be moved via drag-and-drop, and only Pinned discussions can be ordered in custom fashion instead of by Recent Activity. Individual discussion topics can be published/unpublished, bookmarked, and edited. Discussions can be used in Canvas to share ideas and collaborate. Discussion forums can contain text descriptions with formatting, be posted to sub-groups of students within a course, and include files and other attachments. Other options can be specified such as thread replies, liking, grading, and availability windows. Many instructors who use discussions utilize repeated versions of the same basic template (i.e. Week 1 Discussion, Week 2 Discussion, etc.) Canvas allows instructors to create duplicate versions of a discussion thread that can streamline the process of using many similar discussion topics. Duplicates can then be customized and edited instead of created from scratch every time. The process for posting a reply on discussion boards is fairly simple and straightforward, and mostly the same for both instructors as well as students. Text can be styled using the formatting toolbar and individuals can upload attachments as well. Using the Discussion Boards on Canvas can be somewhat daunting, but there are several tools and options available to make the task easier. These include expanding/collapsing all threads as well as marking individual posts as read and unread. The SpeedGrader interface in Canvas allows instructors to see all the contributions a student has made to a particular discussion board topic and leave feedback as well as assign a score. However, this works only if one discussion board topic is tied to a single grade item and does not allow multiple discussion topics to be linked to a single grade item. Instead of using the SpeedGrader interface to assess multiple discussion board topics for a single grade item, instructors can locate data on student participation and use that as the basis for their grades instead. Instead of uploading files directly to Modules, it's best to upload them to the File Manager first. The File Manager interface is similar to that of a computer in that it utilizes a system of nested folders that contain files, and items can be organized similar to a computer as well. Files can be uploaded to the File Manager via simple drag-and-drop. The Canvas File Manager allows you to download files or folders, rename items, move items, and delete items. Files and folders can be moved to other locations via drag-and-drop. The file browser can be used to show files as well as expand and collapse folders. All My Files can be used to show every file across all courses that an instructor has access to. When re-using files from one semester to another, information like dates and meeting locations will need to be updated. Instructors can use the File Manager to upload revised versions of documents as long as the filename remains unchanged. Weighted grades in Canvas can be used to assign grades based on how much percentage points a grade category is worth (i.e. Weekly Quizzes worth 10% of final grade) This can allow for a great deal of flexibility for instructors who do not want to rely on a strict points-only grading system. The Canvas gradebook is created dynamically as various graded items (quizzes, assignments, discussions, etc.) are created elsewhere in a course. This means that instructors do not have to manually manage gradebook items separately from the actual assignments that are being graded. SpeedGrader is the name Canvas uses for its grading interface, and it is replete with powerful features that help streamline an instructor's grading workflow. This video covers some of the basic elements of SpeedGrader. Instructors can use the annotation tools in SpeedGrader to markup student submissions, leave comments, and engage in dialog with students about the comments. These powerful tools can be used on tablets such as the iPad or a Microsoft Surface. Creating a rubric within Canvas and assigning criteria, ratings, and scoring options. Rubrics can be linked to a specific assignment in one of two ways. Either by creating a rubric when the assignment is being edited, or by first creating a rubric and then manually linking it to an assignment. Rubrics can be customized in a variety of ways in addition to simply adding criteria and ratings. Instructors can also specify such options as removing ratings to write individual comments, remove points from the rubric, and posting Outcomes to Learning Mastery Gradebook. Rubrics can also be specified for use when grading an assignment which can streamline the grading process for instructors. After a rubric is created it can be used to grade student submissions when using the SpeedGrader tool. Instructors can select ratings for individual criteria, and points are automatically added up for an overall total. Instructors can also leave comments on individual criteria. Canvas utilizes modules that function as containers for holding course items such as discussions, assignments, documents, exams, etc. Modules can contain various types of course content, and adding content to a module is a simple process involving just a couple of clicks. Modules can contain Assignments, Quizzes, Files, Content Pages, Discussions, Text Headers, URLs, and external tools. It works best to first create content items and then add them to modules rather than create them on the fly as they are being uploaded to modules. Canvas allows for organizing module content with text headers and item indentations. This can be a useful way of segmenting content and adding visual cues for students to understand how specific module items are related. Modules cannot be nested inside modules, and a group of related content items might be best if placed inside its own module. A more in-depth look at how various course items can be created separately and then added to content modules. This includes creating a module, adding multiple files, adding an assignment, adding a discussion, and adding a quiz. Instructors who use modules to deliver all relevant content items to students can then remove the associated content types from the navigation bar (i.e. Grades, Assignments, etc.) to made the student experience more streamlined and straightforward. Modules in Canvas can be published or un-published depending on when instructors want to release content to students. Modules can also contain files (Documents, Spreadsheets, PDFs, etc.) that have been uploaded to the Canvas file manager. Files can be re-ordered within modules and set to published or un-published. Instead of using the Canvas File Manager, files can be uploaded directly to modules. This can help some instructors streamline their workflow, though a general best practice is to use the file manager for uploading and managing all files and then importing files into modules. Canvas let instructors specify prerequisites for Modules in order to control the process by which students are allowed to complete course materials. Modules are released only after certain criteria are met, which can help instructors set mastery goals for students or release content in other ways aside from just using date/time restrictions. Requirements can be set for any Module in Canvas in order to specify the items that must be completed by students in order for the module to be considered complete. Requirements can be set so they must be completed en masse, individually, or in a specific order. Files inserted into Canvas modules can be re-named to more accurately reflect the content of the files, and renaming within modules does not affect the actual filename. The Arc media platform in Canvas allows for rich engagement with video content. Instructors can use it for storing videos as well as recording content for courses such as screen-captures and webcam updates. Arc also allows students to comment on videos and gives instructors access to powerful analytics to help assess student engagement with videos. Arc can generate captions for videos which may be edited for clarity by instructors. Instructors can create videos on their own devices (i.e. laptops, desktops, tablets, etc.) and then upload them to the Arc media platform within Canvas. Videos can then be used in Canvas or shared publicly via custom sharing links. Arc allows instructors to share videos publicly by creating a custom link which can be subsequently revoked if desired. Videos can also have custom thumbnail images which can aid in presentation and organization. The Arc tool can create captions for videos with roughly 85% accuracy. Captions can be edited after they are created, and custom third-party captions can also be uploaded to an Arc video as well. The Arc tool in Canvas allows instructors to create screen-capture recordings for short presentations, lectures, even simple news updates. Videos can be trimmed and edited before uploading to Arc and then inserted into a Canvas page. Embedding media from Arc such as screen recordings and webcam videos into Canvas either by putting them directly into modules or by inserting them into custom HTML pages. When sharing YouTube videos with your class, the Arc platform can serve as a way to enrich those videos by offering instructors access to student analytics and in-line commenting. Canvas utilizes Question Banks which instructors can use to construct questions that are then imported into Quizzes, Tests, Exams, and even Surveys. Understanding the difference between Quizzes and Question Banks will help make instructors' workflows more efficient. Question banks should be created prior to making quizzes, and these question banks function as containers into which all quiz questions should be placed. After creating a question bank the questions can then be imported into one or more quizzes. After constructing a question bank, an instructor can use those questions to create a Quiz. Questions may be placed in question groups or left outside of question groups. After creating and publishing a Quiz, it is also populated into the gradebook automatically. Quizzes in Canvas can contain a group of questions taken at random from a larger set of questions. Instructors can utilize these types of random question groups in conjunction with non-random questions that all students must answer. Quizzes in Canvas can be customized in a variety of ways including using the formatting toolbar to format text and instructions, specifying the type of quiz (graded, ungraded, etc. ), shuffling quiz answers, setting a time limit, allowing multiple quiz attempts, and controlling when and how students can see their quiz responses. Instructors can use options in Canvas to customizer quizzes with parameters such as showing one question at a time, restricting quiz access based on codes and IP addresses, assigning quizzes to students or groups, and setting date availability. Canvas allows for the creation of comprehensive exams that utilize previously-used questions from other quizzes and tests. Questions can be re-used en masse or in smaller randomized groups. Instructors can also include questions that are new and not re-used from previous quizzes. Instructors can use the advanced features in the Quiz tool to give a student or certain groups of students access to a quiz outside the normal date range for the rest of the class. Canvas allows instructors to give extra time, and extra quiz attempts, to individual students. The method for doing this is simple but does not use the same set of menus and screens as the normal Edit Quiz function. Canvas lets you update a student's quiz score by adding Fudge Points or by giving points to individual questions. If you enter the wrong answer as correct when setting up a quiz in Canvas, you can re-grade the question after students have already taken the quiz. In doing this you have some options as far as how student scores on that particular question are handled including giving full credit, counting both answers as correct, and more. Many quiz questions in Canvas can be auto-graded, such as Multiple Choice or True/False, but questions with subjective answers and grading criteria must be scored by the instructor or a TA. The SpeedGrader interface makes scoring these questions fast and easy. While there is not a one-click solution for copying a quiz in Canvas, the operation can be performed with a few extra steps involving exporting and then importing a quiz. A step-by-step walkthrough for creating a Multiple Choice quiz question within a Question Bank in Canvas. A step-by-step walkthrough for creating a True/False quiz question within a Question Bank in Canvas. A step-by-step walkthrough for creating a Fill In the Blank quiz question within a Question Bank in Canvas. A step-by-step walkthrough for creating a Fill In Multiple Blanks quiz question within a Question Bank in Canvas. This question contains multiple text entry spots for students to enter their answers. A step-by-step walkthrough for creating a Multiple Answer quiz question within a Question Bank in Canvas. This question has multiple text fields for students to enter their answers. A step-by-step walkthrough for creating a Multiple Dropdowns quiz question within a Question Bank in Canvas. This question contains multiple dropdown menus with possible answer choices for the student to select. A step-by-step walkthrough for creating a Matching quiz question within a Question Bank in Canvas. This question can include distractors which are gratuitous answer choices designed to ensure that students really do understand the concept being evaluated in the question. A step-by-step walkthrough for creating a Numerical Answer quiz question within a Question Bank in Canvas. Students must enter a numerical value for their answer which can be evaluated by Canvas and also fall within a certain range or margin of error. A step-by-step walkthrough for creating a Numerical Answer quiz question within a Question Bank in Canvas. This question type can specify a level of precision required by the students in terms of significant figures. A step-by-step walkthrough for creating a Formula quiz question within a Question Bank in Canvas. This question contains numerical values which are created according to variable parameters set by the instructor. A step-by-step walkthrough for creating an Essay quiz question within a Question Bank in Canvas. A step-by-step walkthrough for creating a File Upload quiz question within a Question Bank in Canvas. This question cannot be scored by Canvas and the file being uploaded must be evaluated by the instructor. A step-by-step walkthrough for creating a Text quiz question within a Question Bank in Canvas. This question type has no points and no correct answer, but can be used as a way to separate different sections of a quiz. Instructors can use question feedback to give students input on correct and incorrect answers. Feedback can only be seen when it is released to students according to parameters specified by the instructor during the creation of a quiz. Canvas allows instructors to use the LockDown Browser on quizzes, but it must be enabled via the Settings option and adjusting the navigation menu. The Canvas mobile app for instructors is a way for instructors to interact with existing content on their Canvas courses and also communicate with students. It is not specifically designed for creating new content though it does offer some limited functionality in that regard. Instructors can use the Canvas mobile app to access files and edit some parameters like changing access levels and get sharable links. Files are fully viewable on the mobile app as well, including PowerPoint, Word, PDF, and more. Instructors can use the Canvas mobile app to quickly and easily post news announcements to a class or individual sections within a class. The Canvas mobile app is designed to be an easy, simple tool for instructors and students to interact on discussion board. The app makes it easy to post replies, format text, and create new discussion threads.